Quagga mussels and other aquatic invasive species can create a host of problems, not just for boaters and anglers but for all the residents of New Mexico. Quagga mussels can damage critical infrastructures and can have adverse impacts on wildlife. Not yet detected in New Mexico, rules have been put into place in an effort to prevent their arrival. The time to attack invasive species is before they arrive, not after. Although they have yet to be documented in New Mexico, quagga and zebra mussels are among the most damaging. They now infest over 600 bodies of water across the nation. These invasives cost taxpayers billions of dollars due to damaged infrastructures such as hydroelectric, irrigation and water intakes. They also can lead to population declines and local extinctions of native wildlife. Because of those threats the State Game Commission approved a number of new rules that went into effect Feb. 12. In an effort to keep New Mexico free of some highly destructive aquatic invasive species and to stem the spread of others, the amended rules were adopted. “Not all invasive species are created equal,” said James Dominguez, the New Mexico Game and Fish Department’s aquatic invasive species coordinator. “Some, such as the zebra and quagga mussels, can have a wholesale impact on the existing environment, including recreation and agriculture. The quagga mussel, for example, can live for about five years and can release approximately one million fertilized eggs a year. New Mexico is one of only six western states to remain free of the invasive mussels. However, it is surrounded by neighboring states where the mussels are established. The primary method for introduction is water-based activities such as mussels hitching a ride on a watercraft or in bilges, live wells or any other equipment that holds water or remains wet. In 2007, 1,000 miles farther west than previously documented, quagga mussels appeared in Lake Mead along the Arizona-Nevada border. They quickly spread to other waterways in Arizona, California and other states in the west. The most effective deterrent to their spread is to clean, drain, and dry watercraft after each use. Dominguez said it is important for all watercraft users to know which waters are positive for invasive mussels and the resources available to remove them before boating in New Mexico. For more information about the rule changes and other news about aquatic invasive species, visit wildlife.state.nm.us/ais or facebook.com/aquaticaliens. Mandatory watercraft inspection required whenever an inspection station is set up and in operation. 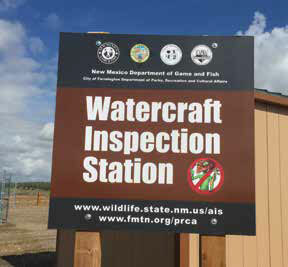 Mandatory inspection and, if necessary, decontamination of all out-of-state registered watercraft or watercraft re-entering New Mexico. Fourteen-day advance notification of intent to transport watercraft 26 feet long or longer into New Mexico. All boaters are required to “pull the plug” and drain watercraft when transporting in New Mexico.